Yemen embassy closure: United States, France, Germany, and Great Britain shutter embassies. 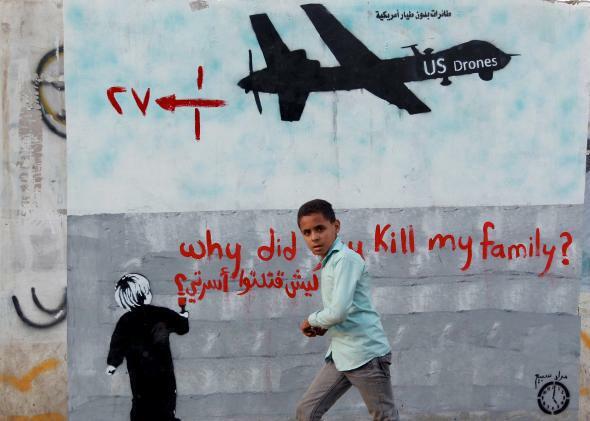 A Yemeni boy (C) walks past a mural depicting a US drone and reading ’ Why did you kill my family’ on December 13, 2013 in the capital Sanaa. The United States and several of its allies closed their embassies in Yemen on Wednesday in an apparent response to the takeover of the country by Houthi rebels. The U.S. had evacuated its embassy staff on Tuesday and shuttered its doors by Wednesday morning, the New York Times reported. The United Kingdom also announced a “temporary suspension of operations” on Wednesday, while the French embassy announced it would be closed as of Friday and encouraged French citizens to leave the country urgently. An official at the German embassy told the Times that it was also closed, but that its diplomats hadn’t left yet. The move comes after the group of Shia rebels seized control of the country last month in an apparent coup. Citing an “uncertain security situation,” the State Department urged American citizens living in Yemen to leave the country and those planning to visit to cancel their trips. It was not clear why the Western countries closed their embassies now, because they have been left open during much more violent times in the capital. He said the Houthis would assure the security of the embassy compound until American diplomats returned. The move comes one day after senior Houthi leader Saleh Ali al-Sammad said his group wanted a power-sharing government partnership and was hoping to maintain normal relations with the United States. The group is holding the previous president Abdu Rabbu Mansour Hadi, who resigned last month under pressure from the militants, under house arrest. The Times also reported that a Western diplomat was saying that an attack on an American Embassy vehicle carrying diplomats at a Houthi roadblock last month was “far worse than previously known,” and included 87 rounds of automatic weapons fire. The people inside the car were able to escape thanks to the vehicle’s armor.